Glencolmcille is on the rugged west coast of Donegal, approximately 50 minutes’ drive from Donegal Town or 25 minutes from Killybegs. The Folk Village Museum is a 2 minute drive or 10 minute walk along the coast road from the centre of Glencolmcille village (known as ‘Cashel’). Transport options in Donegal are private vehicle or bus. The fresh air and the beauty of the landscape will also reward the cyclist or walker. The more remote rural roads in western Donegal can be hilly, windy, bumpy or dotted with resting sheep – but they are always extraordinarily scenic. Road signs are lettered in both English and Irish, and sometimes only in Irish. Explore the beauty of Glencolmcille click here. Use the zoom / pan controls on the map! There are daily buses to/from Glencolmcille from local towns such as Dungloe to the north and Donegal Town to the east. These towns have regular connections to larger towns and cities, such as Letterkenny, Derry, Sligo, Galway and Dublin. The nearest rail connections are in Derry or Sligo. Check the website of Ireland’s national bus company, www.buseireann.ie, for route information, up-to-date timetables and online bookings. Tourist offices throughout Ireland can also help you plan your bus journey to Glencolmcille. Cuir rud beag ama ar leataobh sa dóigh is go dtig leat pléisiúr a bhaint as an turas ó Bhaile Dhún na nGall go Gleann Cholm Cille. Tá radharc le fáil ar Chuan Dhún na nGall ar feadh tamaill mhaith - agus gach radharc acu sin suntasach agus sultmhar. Téann an príomhbhóthar ó Bhaile Dhún na nGall trí na Cealla Beaga, port iascaireachta fuadrach a bhfuil líne de shoithí geala dearga, glasa nó gorma ar snámh ann. Tá boladh láidir sáile agus éisc san aer. Bíonn na faoileáin le cloisteáil ag scréachaíl sa spéir agus chífidh tú iad ag tumadh síos i dtreo na mbád. 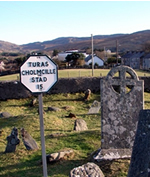 Leann an bóthar ó na Cealla Beaga go Cill Chartha, agus o sin go dtí droichead na Carrige ta tú anois í bparoiste Ghleanncholmcille. 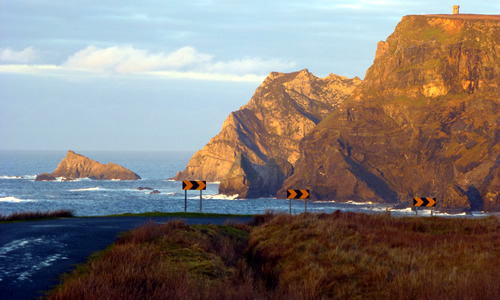 This is an inspiring drive, with no end to beautiful scenery as the road curves back and forth along the edge of Donegal Bay. Killybegs, a bustling fishing port with rows of bright red, green and blue trawlers docked in the harbour, is a fine stop for lunch or fish and chips. Strong salty sea and fish aromas fill the air, while seagulls screech in the sky and spiral down toward the boats. Heading out of Killybegs towards Kilcar and Carrick the road takes you past Fintra and its white sand swimming beach before climbing higher, delivering views over the Bay with each twist and turn. On a clear day you can see Croagh Patrick in County Mayo and the mountains of Yeats Country in Sligo. A worthwhile diversion off the main road is the narrow coast road to Muckross, offering more twists and turns and views on its way to the charming village of Kilcar. From Kilcar to Carrick choose between the contrasting attractions of the coast road with its sheltered bays, or the main road over the stark open moor of Bogagh. Once you cross over the bridge at the riverside village of Carrick you have reached the parish of Glencolmcille. From Carrick to Glencolmcille the scenery begins to take on a wilder aspect, giving way to endless acres of soggy, black boglands crossed over with soft green and red heather-covered mountains. Drive carefully as you traverse the bog as sheep may be resting on the road. Eventually the road drops into Cashel, the village in the middle of the Glen Valley which is referred to as Glencolmcille or simply as "Glen" by the locals. Explore Cashel on foot: walk to the beach (opposite the Folk Village Museum) or walk a circle around 'the block', passing the wonderful Protestant Church. Beyond Cashel the road continues to the Folk Village with incredible views of the Atlantic Ocean and Glen Head, concluding at the Silver Strand, a perfect cliff-edged white sand swimming beach. You only have to visit once to understand why a trip to Glencolmcille is worth every mile of the journey.